Soft,thick and well worth stepping on after getting out of your bath. The absolute type of bath mat the I've been looking for.These are hard to find on the retail shelves. I love them. I just got these bath mats and they are wonderful. I truly love the purple color so rich looking and soft. I recommend these bath mat for your bathroom. Absolutely like these bath mats. They have a great selection in colors and don’t lint much in the wash. It’s great when you can just toss them in the wash with all the other towels. No special washing needed and I feel they absorb water much better than a foam bath mat, and don’t take up as much room in your cabinet so you can keep multiple colors on hand. 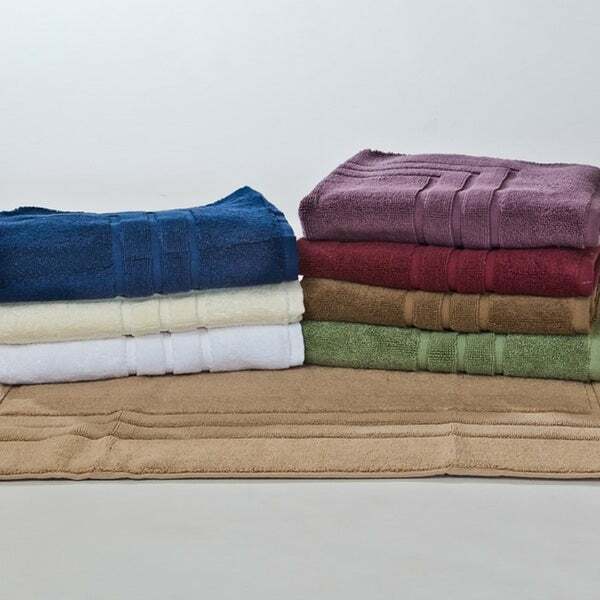 Hard to find 100% cotton bath mats, not bath rugs. Loved being able to throw in when I wash the towels. Excellent idea to sell a set of two, since I, at least, have two sets of my towels. I would have given them five stars except the one I’ve used has already snagged. Hope that isn’t a forewarning of not so good things to come. Thick, dense, absorbent. Very good price. These bath mats are amazing!They are very thick,soft&they are bigger than our others,so more effective.We are very please with the quality of this product.They are our favorite bath mats in our home.Thankyou for a great product. Very nice quality bath mats! Thick and cushioney; I love stepping on them getting out of the shower. Colors are great too. So glad I bought them. Thick and absorbable bath mat! Large, soft, plush, navy blue is true navy blue. Gave it a 4 because I have not washed it as of yet, but so far it is worth the money! And added bonus - 2 of them! These are not "bath mats" they are cheap towels that started falling apart after one wash. I wanted to return them but I bought them for $**and overstock wanted to charge me $** to send them back. What a RIPOFF!! Average bath mats. I would have preferred heftier quality, but these will do for the moment. These bath mats are larger than what you normally get. They are nice and thick as well as well made. I really like them. Again I am remodeling my bathroom and l think this will look very pretty plus I love purple.